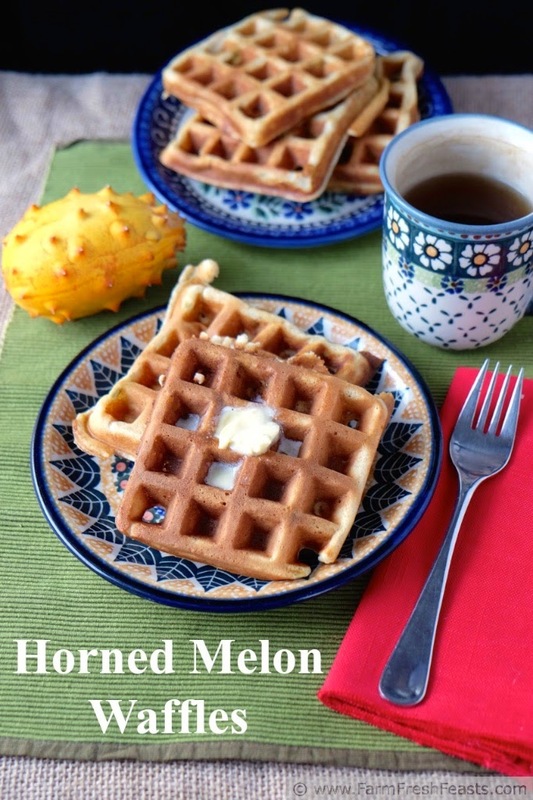 Classic buttermilk waffles with a freaky fruit twist--horned melon in the batter. Horned melon is not a fruit that was grown by the farmers in my community supported agriculture (CSA) farm share. In a G+ food bloggers group Melissa's Produce offered to send cases of FreakyFruits to anyone interested. I said yes. This is my second recipe from that case of fruit. Passionfruit Banana Muffins was the first. I think the next one will be pizza or curry. 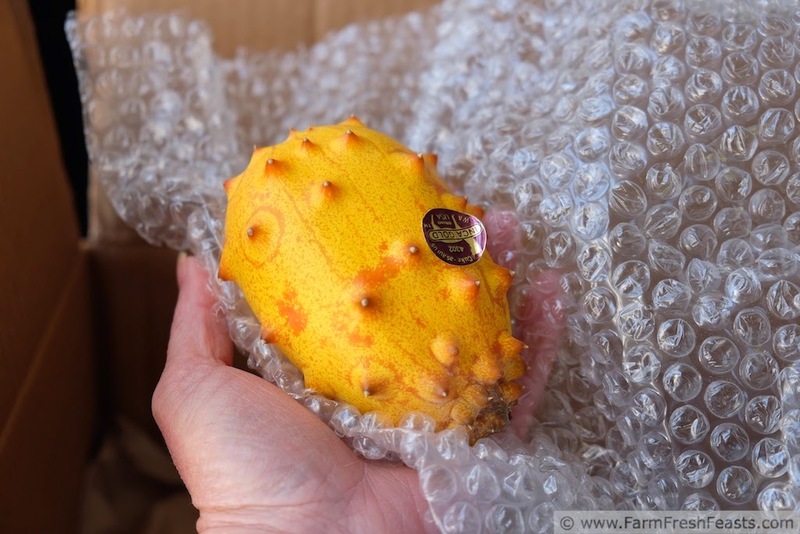 When I lifted off the protective bubble wrap I had no clue what I wanted to do with these fruits--but I like that challenge just like I like the challenge to use the kohlrabi in the farm share! Inspiration struck one morning when I realized that those people who live with me remain keen on eating first thing in the morning and all day long. [I need to be up and about for several hours before I feel peckish.] I used one melon in the waffles and had my daughter use another in a smoothie with banana, vanilla yogurt, and ice. I don't know what my deal is with Dr Seuss' birthday and breakfast. 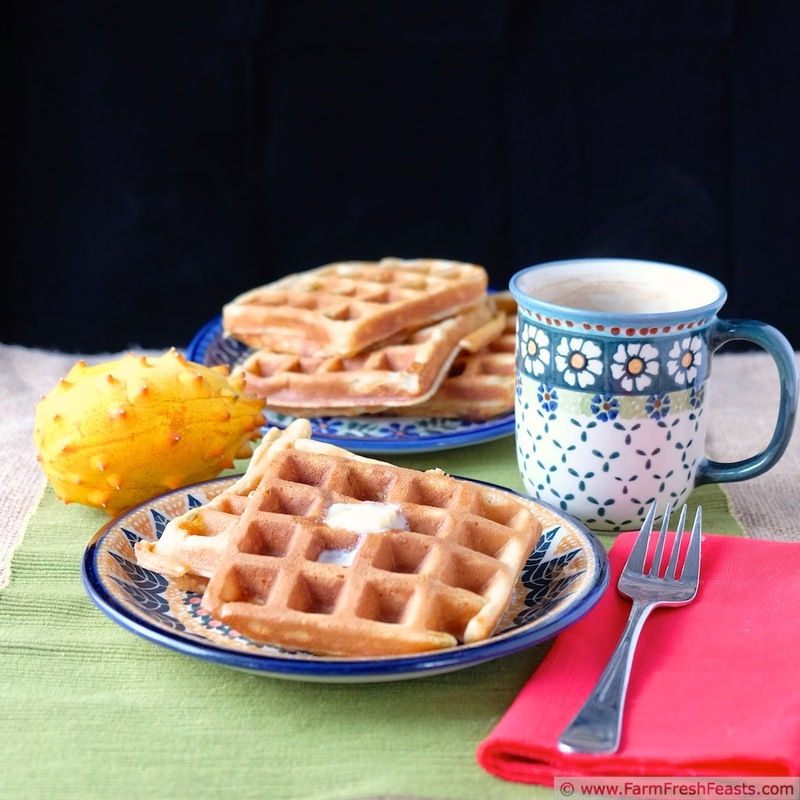 If you wanted to make a Dr Seuss themed brunch to celebrate his birthday, March 2nd, please consider these waffles with a side of Green Eggs No Ham [a vegetarian eggs Benedict with easy spinach Hollandaise--link]. For other recipes using FreakyFruits, please see my FreakyFruits Recipe Collection, part of the Visual Recipe Index by Ingredient. In a large bowl, whisk together buttermilk, eggs, oil and vanilla until combined. Scoop out the pulpy flesh of the horned melon and whisk it in. You'll have strings hanging off the whisk, and that's OK. Dump the dry ingredients on top and whisk until just combined. The set batter aside and walk away! [Walk a dog, start a load of laundry, sip some tea, check up on FB, whatev.] After a nice rest (15 - 30 minutes) preheat the waffle iron and bake according to manufacturer's instructions. 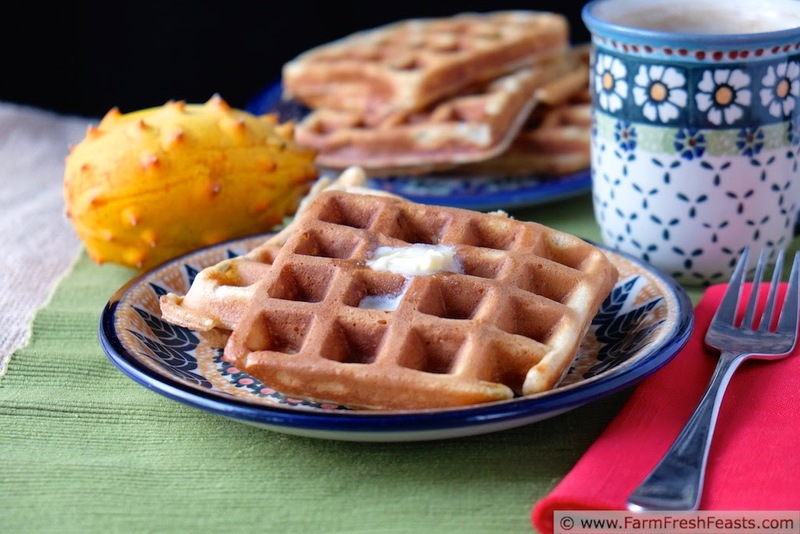 Mine makes about 12 waffles (3 sheets of 4) in my square waffle maker (Amazon affiliate link). 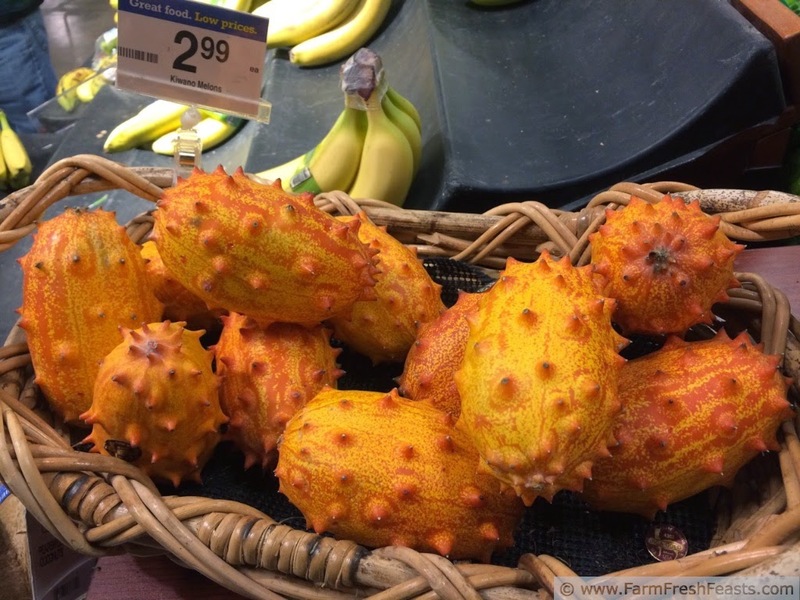 The other day I was at Kroger buying the daily gallon of milk when I spotted horned melon across the produce section. The guy buying bananas probably thought I was a creeper when I whipped out my phone to take a photo, but I don't care. This fruit is available in stores, too! I have never tried horned melon! I'll have to keep my eyes open at the store! I'm delighted to show that it is available at my local Kroger, so it's probably available around you! I see "freaky" fruits at the market all the time, but never have any idea what to do with them - waffles, pancakes, and muffins seem like a terrific place to start! It is daunting, looking at something so weird and trying to think of what to do with it. I mean, how to eat it :) ! The basics are a good way to start. Horned melon! I've never heard of it but I love the sound of these waffles. Also the idea of eating freaky fruit appeals to me because much like you, I like a good challenge and I also adore fruit. Also big Dr. Seuss fan. Now don't take this the wrong way, but you're reminding me of Robert Barker. He's always up for a lark (to go outside, to go on a walk, to have a cuddle, to steal a piece of pizza off the counter). So much so that we refer to him as "Robert Barker, always up for a lark". I think you're up for a lark, too.